I would guess that I’ve buried between 200 and 250 people. For each I tried to develop a eulogy that spoke to the person’s nature and character, and to his impact on family, on friends, and the world. Today, in our unsentimental society, the norm is to eschew the explicit tearjerker (although the tears often happen naturally, at least for me). Instead, we go for a cross between biography and ethical will: The ways in which the deceased influenced my life, the lessons I learned, the experiences for which I am grateful. The speaker introduces his audience to the deceased, as he knew him, and, hopefully, presents an educational and inspiring message along the way. I think R’ Albert Lewis, head of a congregation in southern New Jersey for decades, had that sort of presentation in mind when he asked Mitch Albom to deliver his eulogy. Based on the story Albom unfolds in Have a Little Faith, Lewis meant for him to capture the essence of his life and teachings. A man of more grandiose vision might have asked for a full biography, but Albert Lewis does not present himself as someone worthy of, or seeking, the immortality of publication. He only wants one more educational, inspirational moment, to come at a time when he will not be able to personally deliver it (although he does try – but I won’t spoil it for you), and so he hand-picks Albom, a congregant if somewhat estranged, a writer of considerable success, and someone who could, perhaps, use some education and inspiration himself, to do the job. There is humor here, as well as wisdom - "Getting old, we can deal with. Being old is the problem." There are gut-wrenching moments, perhaps none more painful than when R' Lewis delivers a speech eulogizing his own young daughter, Rinah. We watch the rabbi age, reaching a Yom Kippur when he no longer stands on the pulpit. And stories, stories and more stories, a few of which I have put away to use for myself in the future. Of course, there is much more in this story, which is as much Albom’s as it is Lewis’s or Covington’s, and which also tells the tale of two very different communities. But what I find most rewarding in this read is its peek into the life of a career rabbi. My twelve years in the rabbinate began toward the end of Lewis’s decades, and I am Orthodox where he was Conservative, but often, when Lewis speaks, I hear my own voice. Certainly, there were great differences between Lewis’s rabbinate and my own – the leadership of halachic institutions, the role of בעל קריאה (Torah reader) and the constant flow of classes on my end, as opposed to the trend of metamorphosis in his movement, and the social demands and religious school demands he faced – but, as with the Lewis/Covington comparison, we are similar in our basic drives, that underlying theme of the music of our lives. To bring people close. To create community. To educate and inspire. To communicate a faith we only glimpse ourselves. To give. The author of Tuesdays with Morrie has created a satisfying work here, no small task when dealing overtly with death. I’d recommend Have a Little Faith for anyone who wants to get inside the mind of a pulpit rabbi, for anyone who wants to see what faith looks like from an insider’s perspective, and for anyone who wonders what would happen if he would ask a stranger, “Will you do my eulogy?” I think you’ll get something out of it. Here are some of our programs for after Succot; if you're around town, I'd love to see you there! Rabbi Haskel Lookstein has commented that Yom Kippur night is the hardest time to speak. People are somewhat bloated from their pre-taanis meals, somewhat concerned about how smoothly the fast will go, somewhat worried about how well the חתימה will go, somewhat nervous about how long the speech will go, glancing at their watches, fidgeting with their machzorim. My father quotes Rav Soloveitchik as having made the same observation; Maariv on Yom Kippur is hardly the time for a long and serious derashah. So I will just make one point about the Yom Kippur experience and where it can take us, based on a gemara at the beginning of Yoma. So I will just make one point about the Yom Kippur experience and where it can take us, based on a gemara at the beginning of Yoma. The first mishnah in Yoma mentions that the Kohen Gadol separates from his family, and, indeed, from most of the world, living in a special room on Har haBayis for seven days, leading up to Yom Kippur. R’ Yochanan and Reish Lakish debate the source for this separation – why does the Kohen Gadol go into seclusion, in this ultimate waiting room? What’s the point of having him cool his heels? • R’ Yochanan explains that it’s based on the מילואים, the seven-day period when Aharon haKohen was trained in the avodah of the mishkan. • Reish Lakish explains that the quarantine is based on the ענן, the six days when Moshe Rabbeinu remained in a cloud, before entering HaShem’s presence to receive the Torah on Har Sinai. 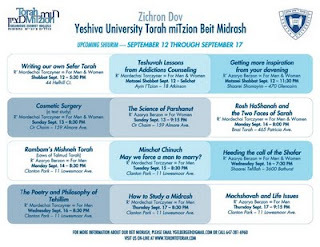 As Rav Soloveitchik explained it, R’ Yochanan’s concept is that a week of separation provides opportunities for training, as a practical matter. This makes sense; the Kohen Gadol needs to undergo training, too, for Yom Kippur. But Reish Lakish’s comparison is less obvious. Reish Lakish equates attending Har Sinai with entering the Beis haMikdash, arguing that Moshe waited before entering HaShem’s presence, and so each Kohen Gadol must endure a Moshe-style experience and be separated from the nation before the Yom Kippur appointment with HaShem in the kodesh kodashim… But why? Where is the benefit? Moshe waits in a cloud, for six days, in order to feel הכנעה, a particular mixture of respect and humility. This הכנעה is a state which is necessary, in some measure, for all relationships. • Children need humility in order to appreciate what their parents and others do for them. • Parents need humility in order not to demand their due from their children. • Spouses need humility in order to listen to each other. • Siblings need humility in order not to stand on their rights. • And students need humility, as do teachers, in order that they learn from each other and appreciate each other. הכנעה is Esther waiting, in trepidation, for Achashverosh. הכנעה is Yosef's brothers nervously waiting for the viceroy. הכנעה is Noach anxiously waiting for word that the Flood is over. הכנעה is a Jew on Yom Kippur davening not in fear, but with respect, with awe, standing before her Creator. Certainly, for that greatest relationship, standing before Gd, הכנעה is a requirement - and so this intimidating experience is a prerequisite for Moshe's ascent to receive the Torah. And as Avot d’Rabbi Natan continues, achieving this state of הכנעה is what made Moshe worthy of transmitting Torah to the kohanim, of creating the שמן המשחה, of passing Torah to Yehoshua, and so on. All that makes us the Jewish people – the Torah, the mitzvot, the Kohanim and their service in the Beit haMikdash – all of it traces to Moshe and his intimidating period in that cloud. Reish Lakish argues that this is what the Kohen Gadol must experience before Yom Kippur, in order to approach HaShem on behalf of the nation with אימה, with יראה, with רתת, with זיע, with fear and trembling, with הכנעה, to meet HaShem on a latter-day Har Sinai, in the Kodesh Kodashim. R’ Pinchas ben Yair said פרישות מביאה לידי קדושה, separation leads to sanctity – and so it did for those kohanim gedolim. So we’ve answered our questions about Moshe and the Kohen Gadol - but we are missing something, I am missing something, approaching Yom Kippur. Granted we will not stand on Har Sinai. Granted we will not enter the kodesh kodashim. But will we not stand before HaShem today, to plead our case? On Rosh haShanah we were tried in absentia, but is Yom Kippur not our day in court, our day to clamber atop Har Sinai and, at נעילת שערים, declare ה' הוא האלקים, declare that HaShem is our Gd and that we are HaShem’s people? Do we not need to achieve קדושה? So where is our הכנעה experience? Where is our anan, where is our perishah, where is our hafrashas shivah yamim? Is it the cheshbon hanefesh of half-remembered flaws and successes we composed during the month of elul? Is it the rushed slichos we mumbled for a week and a half in the early hours of the morning? Is it the embarrassed apologies we made to relatives and friends in hurried phone calls and minutes stolen before and after minyan on erev Yom Kippur? Where is our anan? Tomorrow, Gd-willing, those who are able to stay during the break will learn Sefer Yonah with me. We’ll learn about a man, a נביא, who wanted nothing more than to draw close to HaShem, and who ran away from the HaShem he could not understand, in search of the HaShem he thought he understood. Yonah did succeed in drawing close to HaShem, after a three-day period of perishah, his seclusion in the דג. But what about us? Where is our ענן? Our ענן is Yom Kippur itself. אבות דרבי נתן describes Moshe in the cloud, not eating, not drinking, just contemplating a meeting with HaShem. Yom Kippur is our day when we neither eat nor drink, our day when we tremble and contemplate a special audience before our Creator, a reunion with the בורא עולם. Moshe had six days. The kohen gadol had a week. Yonah had three days. And we, starting tonight, have just one day. Perhaps their isolation was longer because their ultimate exposure to HaShem was more intense. Perhaps their isolation was longer because they could do more with the opportunity; we struggle to maintain intensity for even one day. But whatever the reason, all we have is this one day plucked out of time, from כי הנה כחומר tonight until we encounter HaShem at נעילת שערים tomorrow night and declare ה' הוא האלקים. This is our opportunity for bona fide הכנעה and a cleansing process akin to Moshe’s and akin to the Kohen Gadol’s, and it must suffice for our preparations for קדושה, so that we meet HaShem with true humility. But one last note: Our exposure to HaShem doesn’t end at ה' הוא האלקים, just as Yonah’s closeness to HaShem is not supposed to end with his emergence from the דג, and just as Moshe’s closeness to HaShem does not end at Sinai. The moment of intense exposure to HaShem ends – but the repercussions continue. Yonah’s moment of closeness to HaShem is meant to power his return to Nineveh and his on-going career as a נביא ה'. Moshe’s moment of closeness to HaShem powers the next thirty-eight years, and the transmission of Torah to בני ישראל and to all subsequent generations. And for us, our moment of closeness to HaShem, our ה' הוא האלקים, powers our entire year. It is a spark of lightning charged with unimaginable wattage. It is a burst, an intense surge of power – and it can drive us far, far into our own future. It all begins with tonight’s הכנעה through perishah, our separation from this world, from eating and drinking and physical pleasures, for just one day… and where it will lead, Gd knows right now, and we will learn over time. Let’s take advantage, and so earn a גמר חתימה טובה. 1. It's a simple point, which could use greater expansion in terms of community vs isolation in Tanach and Halachah, but as I said at the outset - Kol Nidrei and Maariv on Yom Kippur night are not the time. 2. The Yoma discussion is on 3b, and the Rav's analysis is the first shiur in שיעורי הגרי"ד: עבודת יום הכיפורים. 3. The question of when the cloud-isolation took place, in relation to the עשרת הדברות, depends on the resolution of the 6/7 Sivan debate on Shabbat 88. 4. Rabbi Pinchas ben Yair is in the last mishnah in the 9th perek in Sotah. 5. Yes, the pun on Back to the Future is intended. One of the policies we established at the outset of our Toronto project is that we are not rabbis creating a shul. • We will do nothing, programmatically or otherwise, to undermine any shul rabbi. Part of this is personal; after a dozen years in the shul rabbinate, I would never do anything that would take anything away from a sitting shul rabbi. I respect and love shul rabbis, I know what it means to be in their shoes, and this is a matter of highest importance to me. I would not have signed on, were this not our policy. Part of this is halachic; as the gemara makes clear, every location has its own halachic authority. Classic סמיכה (ordination) was like filling a seat on a judicial bench; your license was for a specific location, where there was a need. That’s why major talmidei chachamim didn’t receive סמיכה; there was no court vacancy. And part of it is communal; having multiple rabbis offering psak is bad for communal unity, and even if those rabbonim actually agree. I’ve seen it in my professional life, repeatedly. Competition is good in many areas, but when it comes to leadership, to quote Sanhedrin 8a, דבר אחד לדור ואין שני דברים לדור, there is one leader for a generation, not two leaders for a generation. The one catch: In theory, all of this is clear. In practice, it becomes complicated. • I can be standing in a minyan and someone can turn to me to ask whether he needs to repeat the amidah for missing המלך המשפט; it’s a ביעתא בכותחא question, not something requiring analysis. I get a call from someone who has a halachic problem an hour before Shabbos, and he doesn’t want to bother the rabbi. Someone asks me to discuss a halachic issue with him, but he doesn’t ask me for a final decision, a psak. • The same gray areas develop regarding our minyan rule; what if a group comes to a late shiur, and they want to daven maariv afterward? • And regarding avoiding undermining a shul rabbi – is it undermining if we schedule shiurim and a rabbi’s congregants attend, resulting on a drain in his own audience? So the implementation isn’t straightforward, but I believe we must take this tack – for the sake of community, for the sake of halachah, and for the sake of my personal comfort. We are not separatists; we are here only to help, להגדיל תורה ולהאדירה. Sports reporter on 680 AM, talking about last night’s unusual confluence of late-game wins by both the Maple Leafs and Blue Jays – “I’ve been broadcasting sports since the Diefenderfer administration, and I’ve never seen this.” Okay, maybe it wasn’t Diefenderfer, but it was something like that. Add this to the list of Canadian politicians I’ve never, ever heard of. They say a startling number of Oklahoma students don't know George Washington was our first president, but I'd wager Diefenderfer ranks even lower than John Tyler. But to the more serious point at hand: I mentioned in my previous post that my Rosh haShanah davening had one serious ‘glitch.’ I’ve been mulling that problem for the past few days, and talking to a few shul rabbi friends about it. When I was a shul rabbi, despite all of the difficulties of concentrating on Rosh haShanah/Yom Kippur davening while being responsible for the shul, and despite the challenge of contemplating, and davening for, so many people’s needs, I always felt - mostly subconsciously - that I had an ace in the hole. I had a claim I could make that would win the day, despite my sins and flaws. It’s arrogant, and I know that, but I felt that I could stand before Gd and say, “I give all of my time and energy to chesed. I get up in the middle of the night to go to the hospital, I stay up late preparing classes, I go way out of my comfort zone to reach people and help them. I know I am far from perfect, I know I am far from where I should be, but at least I have this merit, and in that merit please help these people, please help me, please forgive me... and besides, I am needed for all of these people...” It was subconscious, but now I see clearly that it underlay my entire approach to Rosh haShanah and Yom Kippur. And now, I’ve lost that. • Some of that is because of society’s value system, which recognizes service of others over personal growth. • Some of it is a “Who moved my cheese” phenomenon, where my success and sense of worth for the past dozen years was defined by how many people I helped, not by how much personal learning I did. I imagine people who retire, or change professions, or have their kids graduate/marry/move endure similar challenges. • Some of it is that many of my classes here are more technical, like Minchat Chinuch, and are taught to people who are advanced enough to do their own learning. There isn’t that same feeling of תורת חסד. • And some of it is the fact that I know that there are many great teachers in Toronto, even if I have some unique element in what I do. It’s not like Allentown, where the rabbi is the source for so much, where that which the rabbi does not do will simply not be done. I shouldn’t overstate; I know that what I am doing here is good, is helping people, and is even important. I enjoy what I am doing; it’s a wonderful challenge and it is a worthwhile enterprise. And Gd knows I’m not slacking off. But I’m adjusting to a different system of work, a different benchmark for success, a different scale for valuing my impact. I suppose that the self-evaluation process of Elul and Rosh haShanah and Yom Kippur will just be part of that adjustment. Therapydoc, if you're reading, I'd love to hear your take. I am glad to report that, Thank Gd, my first Rosh HaShanah as a non-rabbi in 14 years was a success, for the most part. With the great help of some friends, I found a minyan which had everything I wanted: A quiet davening at a good pace, with solid baalei tefillah who clearly knew what they were saying, and with a good tokeia for shofar. Best of all, the structure of the room was such that I had a seat along a wall off to the side and away from the action, so my oldest and I could have some element of privacy while remaining part of the tzibbur. I didn’t even mind that they made me work, doing the derashah on the second day and being the מקריא for shofar. The less serious glitch was that after davening on the first morning I was asked to give a shiur that night, but it worked out all right; I recycled a shiur from a week earlier, adding some extra elements to suit the crowd. Source sheets – and a chance to review my own notes - would have been nice, but it was not to be. The more serious glitch was a larger davening issue I’m trying to puzzle out, a greater issue of post-rabbinate bakashot. That may be my next post, if I can find a way to express it. To return to the title of this post, though: Giving the derashah today was actually a harder experience than I had anticipated. For me, a derashah is personal, a meaningful communication between speaker and tzibbur about more than just the way to understand a pasuk or a concept. A derashah is not a shiur; a shiur is educational, and so is a derashah, but a derashah delivered during davening – and on Yamim Noraim no less – should express the feelings of the day, and help direct the feelings of the day. It should be from the heart, and it should reach the heart. So writing it took me quite a while, picking a topic and rejecting it and picking another and developing it and then rejecting it, and so on. I tried on past derashos and rejected them, wanting something that represented where I stood today. Finally, I found a thought I felt could suit the group I expected in the minyan. I hope it worked for them. Here’s what I ended up saying; long-time readers will recognize elements from here and here. Excuse me for not translating the Hebrew; I’m short on time. According to Rav Chaim Medini, author of the encyclopedic שדי חמד, Rosh HaShanah should begin with a fruit. Not the new fruit we ate last night, and not the apple dipped in honey, but the fruit that Adam and Chavah ate in Gan Eden. Rav Medini wrote that some communities hold a public קריאת התורה throughout the week before Rosh haShanah, reading one of the days of בראשית each day, until we arrive at Rosh haShanah on the heels of Day 6, with the story of Adam and Chavah eating the fruit in Gan Eden on our minds. This powerful minhag reminds us of our major Rosh haShanah mission – to correct the wrong of Gan Eden by being ממליך ה', recognizing HaShem as our intimate King. “Intimate king” sounds like an oxymoron – a king is a national figure – but this is the Torah’s vision of any king, and certainly HaShem. A מלך is a personal leader who knows and cares for each individual. As the Rambam wrote, a king is "חונן ומרחם לקטנים וגדולים, ויצא ובא בחפציהם ובטובתם, ויחוס על כבוד קטן שבקטנים... ויסבול טרחם ומשאם ותלונתם וקצפם” – A king is gracious and merciful to the small and the great, he comes and goes at their desire and for their benefit, he cares for the dignity of the smallest of the small, he bears their burdens and complaints and anger. This is a מלך, and this is the relationship HaShem wished to have with Adam and Chavah, together in the גן. But when drawn in by the נחש, when they became jealous of HaShem’s power, Adam and Chavah challenged HaShem’s status as their king, and sought to become kings themselves. HaShem called to them, איכה, where are you, what happened to our dream, what happened to having Me as your personal מלך? Where did it go? And Adam and Chavah heard קול אלקים מתהלך בגן לרוח היום, they heard a sound associated with HaShem moving in the garden, and according to Rav Soloveitchik what they heard was actually HaShem leaving the garden, HaShem walking away from that union. And then they were removed from the garden as well, and the union with that intimate מלך was over. This קריאה reminds us of what could have been, the union we might have experienced, had we not eaten the fruit and separated from HaShem. We separated from HaShem, and HaShem separated from us. But the שדי חמד records a second Rosh haShanah practice, another קריאת התורה. In this מנהג, during the days that lead up to Rosh haShanah we read pesukim associated with construction of the בית המקדש. This minhag is powerful, too, for it reminds us that we can succeed in righting that wrong of Gan Eden, we can reunite with HaShem. We can identify a place on earth as פה אשב כי אויתיה, a place HaShem would actually desire. We can bring קרבנות, we can bring קטורת. We can declare HaShem as מלך, as Moshe and Yehoshua and Dovid and Shlomo did, and we can have the closeness of גן עדן again. ועשו לי מקדש ושכנתי בתוכם, We created a mikdash and HaShem dwelled among us, with miracles and glory! But even then, even in that glory in the משכן of the desert and שילה and נב וגבעון, and then in Shlomo’s בית המקדש and in Ezra’s בית המקדש, there was still a distance; we did not fully declare HaShem as our King. In our insistent independence, and due to the influence of our neighbors, we were not fully capable of being ממליך ה'; we fell into עבודה זרה and עושק, idolatry and corruption, and although נביא after נביא warned of the gap remaining between us and HaShem, we never succeeded in bridging it. • HaShem offered us a human מלך, whose job it would be to unite the nation in the service of HaShem. As the Rambam wrote regarding משיח, ויכוף כל ישראל לילך בה ולחזק בדקה, the king compels all of Israel to follow the Torah. • HaShem offered us human כהנים, who would serve as שלוחי דרחמנא as well as שלוחי דידן, HaShem’s agents and our agents, bridging the gap for בני ישראל in that בית המקדש. As Rashi sees it, this was a concession to our inability to be ממליך HaShem fully. • And HaShem gave us נביאים to convey the word of HaShem, because at Har Sinai we said לא אראה עוד ולא אמות, we cannot perceive HaShem directly, the closeness is too much. And so, even in the heyday of the mishkan and the beit hamikdash, we still retained a distance. We were still out of Gan Eden. And as we count down the days to Rosh haShanah, per the שדי חמד’s reported minhag, we read about the בית המקדש and re-commit ourselves to bridging that gap. • We were created as independent בריות, and we pride ourselves on that ego-driven independence; it’s hard to commit ourselves to HaShem’s control. • We are allergic to intensity, to a complete, all-consuming relationship which will demand our attention, to the exclusion of so much else. It’s why some people talk in shul, it’s why some people laugh at serious moments; our peculiar hybrid of נשמה and גוף recoils from going too much one way or the other. And so we need to work at this intense union with our מלך, through the words of the davening, through the special food and special clothing, through the קול שופר, through the dramatic קריאת התורה and הפטרה, through the strength of a ציבור. All of it is geared toward helping us bridge that gap and re-create גן עדן, recognizing HaShem as intimate מלך. Last year, I had a stop-me-in-my-tracks moment during the Shmoneh Esreih of the first night of Rosh haShanah. I got caught up in it that night: “You are Avraham’s Gd and my Gd?” Does my faith or my service belong anywhere in the same universe as that of an Avraham? A Yitzchak? A Yaakov?! Talk about hubris! Then I continued, “הקל הגדול הגבור והנורא” And I thought to myself: When I sin with the same mouth that is now praising HaShem in these terms, what am I thinking?! I suddenly flashed on that gemara. Here I am, calling HaShem “מלך.” But despite the regal assocations unique to Rosh HaShanah, HaShem is always מלך – why haven’t I truly come to HaShem as מלך until now? Why have I been unable to develop that intimacy? That awareness of ה' as מלך is the closeness we seek on Rosh haShanah – the intimacy seen in the שדי חמד’s recorded minhagim, an intimacy that will transcend even that of the משכן and בית המקדש with their intermediaries, the מלך, כהן and נביא, and restore our גן עדן union with HaShem. After we were evicted from the גן and HaShem abandoned the גן, HaShem set up כרובים at the entrance, to guard the intimacy of that space. A similar set of כרובים later inhabited the קדש הקדשים, guarding the intimacy of the בית המקדש. Rav Soloveitchik made a beautiful point regarding those כרובים. People usually assume that the כרובים were there at the entrance to the גן to keep people out, but one of the targumim explains their role as just the opposite. The פסוק says they were there לשמור את דרך עץ החיים, to guard the path to the tree of Life – to guard the path, to keep it open. Open for דור דורשיו, a generation that will seek out HaShem. Open for anyone who wishes to re-gain that intimacy. Open for all of us on Rosh haShanah. May we capitalize on today’s opportunity to be ממליך ה', to identify HaShem as King, and so re-create, even if only for a day, that world of גן עדן מקדם. 1. The Rambam on the personal immanence of a king is in Mishneh Torah, Hilchot Melachim 2:6; his note on the king compelling people to follow Torah is in Hilchot Melachim 11:1. 2. The discussion of kohanim as our agents or agents of HaShem is in Yoma 19a-b, and the interaction between R' Yochanan ben Zakkai and Vespasian is Gittin 57b. 3. Rav Soloveitchik's note on HaShem leaving the Gan was in a Tisha b'Av shiur I transcribed. I believe the year was 1981, based on clues in the shiur. Rav Soloveitchik's note regarding the keruvim keeping the path open was from a parshah shiur for Lech Lecha in 1972. I'm disappointed that I haven't had the time to craft derashah-style divrei torah for this website in the past month. To make up for it in some way, here's an article I wrote for the bulletin of our beit midrash's host shul, Clanton Park Synagogue. You can also find an article of mine in the Rosh HaShanah "To Go" from YU'Torah, here; the whole To Go is here. Over the past several years I have become involved in the addictions community, helping people who were dealing with addictions and hosting a chapter of JACS (Jewish Alcoholics, Chemically dependent persons and Significant others) in Allentown, Pennsylvania. ”מדרכי התשובה להיות ...משנה שמו כלומר 'אני אחר, ואיני אותו האיש שעשה אותן המעשים”. The Rambam's advice, which is based on a gemara (Rosh HaShanah 16b), seems to argue that someone seeking to change his ways should abandon his past identity and declare himself to be someone new; how would this gel with self-identifying as an addict for life? The tanna kama (initial anonymous view) contends that one who confesses old sins is like a dog sitting in his own vomit, and one should not dwell upon his old identity, apparently opposing the JACS practice. Rabbi Eliezer ben Yaakov, on the other hand, says that it is praiseworthy to remember one's dated deviance, like the person who acknowledges his addiction perpetually. However, this distinction is not necessarily correct; perhaps both the tanna kama and Rabbi Eliezer ben Yaakov endorse embracing a new identity Perhaps the debate between the tanna kama and Rabbi Eliezer ben Yaakov is actually a matter of psychology: Will repeated evocation of old sins keep me from developing a new persona? The tanna kama takes שונה to imply verbalization and study, like ושננתם לבניך, the mitzvah of teaching our children verbally. A sinner who speaks of his sins and reviews them is like a dog sitting in his vomit. Rabbi Eliezer ben Yaakov, though, understands שונה in the sense of שנים, repetition of the sinful act itself. Speaking of the sin does not mean I am a dog returning to my vomit; only actual commission of the sin would be a foolish caninity. Speaking of the sin can actually aid me in my teshuvah. But there must be a limit; at what point may we see our sins as past? Must we identify ourselves as addicts through our entire lives, for sins committed decades ago? Can that truly help us? This may be where the Rambam's advice - to see ourselves as new people – is most helpful. We stop recalling old sins when we are in danger of allowing them to take over our identity. May all of us merit to leave behind our sins, remembering our past without letting it take over our identity, becoming new people, and so meriting a כתיבה וחתימה טובה. Thank Gd, our adjustment is going well. The kids are happy in school, they have friends. After far too long watching the kids at home, Caren finally has a little time during the day to get things in order before Yom Tov hits. And my position with the new (pause for breath) Zichron Dov Yeshiva University Torah MiTzion Beit Midrash (pause to catch breath) is, thank Gd, turning out to be a lot of fun. The beginning was somewhat tough, as per my earlier post about humility. And I’m running hard, as seen in the poster in my last post. But the work is good, and challenging. I feel like a kid in a candy store, with all of the opportunities to give shiurim and try new ideas. No one is saying ‘No’ to anything we offer, and there is a wealth of venues and crowds and demographics to serve. I do miss the rabbinate, in terms of feeling like I’m doing something for people personally. I was always able to approach Rosh HaShanah knowing that despite my many, many flaws, I could point to specific people I had helped, people who likely could not have received that help elsewhere; the same feeling doesn’t apply to teaching classes, and that leaves a serious gap for me. But I haven’t had the time to really ponder that yet, and to think about ways to fill that need of mine. Here's my big discovery, after one month here: Canada is really different from the US. • Pandora is not available here. Ditto for Hulu, and other media content sites. I don’t have time for them anyway, but I imagine this creates a seriously different Internet experience for other Americans who move here... although, on the other hand, Canada’s few ISPs charge by gigabyte downloaded, so maybe that’s for the best. • Gas prices here are fixed – all gas stations in a given region charge the same price. And better than that: Tomorrow’s price is rigged today, and they announce it today on the radio (680 AM is where I get it, but you can also find it here), after 5:30 PM. I’m not kidding – they have a gas price forecast, and it’s always right. • The metric system seems to be a kind of half-hearted phenomenon here, as though they realize it's a lot to expect of people. Even at Immigration, when they asked for our kids’ height and weight, they said using inches and pounds would be fine. And public temperature displays routine show Fahrenheit numbers. • Trash pickup here is once every two weeks. Compost (meaning food remains) and recyclables are once per week, but trash is every two weeks. I think the drosophila melanogaster lobby got that arrangement passed. • Pediatricians don’t have group practices; perhaps this ties into the whole socialized medicine phenomenon, but all you have are solo practitioners. That makes “call” a mess, of course, and it means very, very long lines in waiting rooms. • Since summer, there’s been a strike by sanitation workers, a strike by driver’s license testers, and more. Somewhere, someone has a schedule of strikes and knows who is going off the job and when. The only strike to be averted so far was a strike by liquor store workers. I kid you not. So I’m learning a new system. But people here are great – no substitute for Allentown, but great nonetheless – and I’m enjoying it, and the kids are happy, and that's the whole ball hockey game. Are you anywhere near Toronto this coming week? Here are some of the events we have scheduled for the coming week... If you're in the area, I'd love to meet you there! This is one of those posts that will make some of my friends say, "Torczyner, why are you embarrassing yourself in front of millions?" To which I will reply, "Because someone else may need this lesson, too." A midrash to Parshat Lech Lecha highlights one of the difficulties Avraham and Sarah faced when they left their homeland to enter a new place: They lost their identity as ideologues, as philanthropists, as leaders. Similarly, a gemara (Rosh HaShanah 16b) enumerates ways to earn atonement, and one of them is שינוי מקום, to change one’s location, to experience exile, so that one enters a new place and fully sheds his old identity (per the Rambam's explanation in Hilchot Teshuvah 2:4 - שגורמת לו להיכנע ולהיות עניו ושפל רוח). I shouldn't be surprised. Because of the nature of my position in the beit midrash – my chief responsibilities are to mentor avrechim and to give shiurim in the broader community – most of my shiurim so far have taken place away from the eyes of the local community. Also, thank Gd, I still look a little young (very little, but I guess it's there). I shouldn't take offense, either; I’ve never introduced myself by title, and I never particularly cared whether people knew about me. And yet, to my considerable surprise, these underestimations did bother me in the beginning, the first few times these conversations happened. To my great surprise, I discovered that I was a little too proud of the things I’ve done. I guess I did start to take myself a little too seriously. To have someone assume I should be an assistant was jarring, and, yes, a little insulting. Looks like I really did need some humbling, an ice-water reality check. Well, mission accomplished; it took a few days, but I’m cured. I just had to go through the experience a couple of times before I could absorb the lesson. At this point, it’s just amusing to realize that I was once annoyed by it. Now, whenever I start to take myself too seriously, I’ll have those conversations to remember, to put me back in my place. Today I happened upon a birthday party for pre-teen Jewish children. The boys wore yarmulkes and the food was kosher, but the entertainment was, well, not dressed in a manner I might have expected for observant Jewish children. This led me to contemplate the strange things we do to our children. We have such high expectations for their development – emotional, religious, intellectual, physical , etc. We spend exorbitant sums, endless hours and many sleepless nights to achieve those goals. And yet, we defeat our own ends by sending them mixed educational messages, on a regular basis. What do we expect our children - these creatures who lack both the neural hardware and the experience-based software to properly digest such conflict - to make of this? I’m not talking about sheer parental wickedness here; bad as that is, the mixed-message phenomenon can actually be worse. When parents present an outright bad model, children can see it, and accept or reject it. We don’t gravitate to a Kayin or an Esav. (Also, see Rama on the challenge of doing teshuvah for a possible sin, as opposed to doing teshuvah for a known sin.) Mixed messages, though, can lead children to question the sincerity of every role model they meet. Of course, mixed messages are, to a certain extent, unavoidable. For example: Kids hear about not losing your temper, about handling situations in a healthy and productive way, about analyzing problems and developing a solution, and then they see you express uncontrolled anger. But that’s normal; every mortal parent goes through that experience, and it can be a chance to teach our children. My problem is with the birthday parties, the scenarios we create, the worlds we form for our children with forethought and volition, which send them conflicting messages. My own example: One of our daughters took karate lessons when we lived in Allentown, in a co-ed environment. The halachic calculation was fairly straightforward: Despite the physical contact, she was young enough that she didn’t qualify for chinuch (halachic education), the chibah issues did not apply for her at that age and so there was no issue of ספי לה איסורא בידים, and there were no other options for much-needed organized physical outlets for her. But now my daughter is older, and I am teaching her about gender-separation on a level appropriate for her age. She can remember the experiences of a year ago. She is not old enough to understand what has changed and what will soon change, and it is not yet time for a full-fledged explanation. I know she wonders why we are doing things differently now. It’s a mixed-message situation, parents having sanctioned something in the past and now revoking their endorsement. I don’t know that I could have done things any differently, but I must recognize that if she is confused about gender-separation, it’s a confusion that I generated, myself. Impressing upon our children the importance of kavvanah [focus] during prayer and then talking to others during the davening. What can we do about these mixed messages, the avoidable as well as the unavoidable? I look at the elements within Torah that offer mixed messages, and that gives me an idea. I see the mixed messages that appear from the Torah’s icons, the leaders who startle us with actions that don’t seem to fit. Whether it’s Sarah or Moshe or Miriam or Dovid, these figures have a remarkable track record of righteousness... which makes their apparent diversion from that record all the more jarring. And I realize that because these leaders have such a grand and complete resume of greatness, these diversions stand out only as exceptions and not the rule, not the model, not what we would select to emulate. Their consistent righteousness drowns out the odd mixed message. And that’s my thought for today: Drown out the mixed messages with clear ones. Mixed messages are part of life, and children will need to learn to deal with gray areas. But as a parent I need to recognize that I can be a confusing teacher. If my children are confused, the fault is not necessarily with them. Or to quote the old computer programming maxim, GIGO: Garbage In, Garbage Out. So I need to take every opportunity to introduce enough clear and consistent messages to drown out the mixed ones. If they see regular Torah learning, hear regular clean language, participant in healthy living and focused davening, then the mixed messages will be the exception rather than the rule, the “man bites dog” instead of the “dog bites man,” and that should decrease their influence. Or so I can hope.